The coach is happy with the progress though during a year where Indian shuttlers have won six Super Series title. Odense: Indian badminton has been on the ascendancy for quite some time now but a pragmatic chief national coach Pullela Gopichand believes that there is still a long way to go before the country can be termed as dominant force in the sport. In recent past, PV Sindhu have won silver medals at the Olympic Games and World Championship along with multiple Super Series victories. Saina Nehwal has made a successful comeback from injury with a World Championship bronze medal while Kidambi Srikanth has now won three Super series titles in one season. "I think we are being too optimistic," was Gopichand's instant reply when PTI asked if India have now become world beaters in shuttle sport. "We as a system are not ready for that sort of a thing (moniker). Unfortunately, there are not many people, who understand world level sport and it is too early to say that. There is immense potential but the system, I think a lot still needs to be done," Gopichand said during an exclusive interview. The coach is happy with the progress though during a year where Indian shuttlers have won six Super Series title. Apart from Srikanth's hat-trick, Sindhu has won two titles and B Sai Praneeth won one. "Overall it has been a good positive year. We had some very good performances at World Championship, Super series. 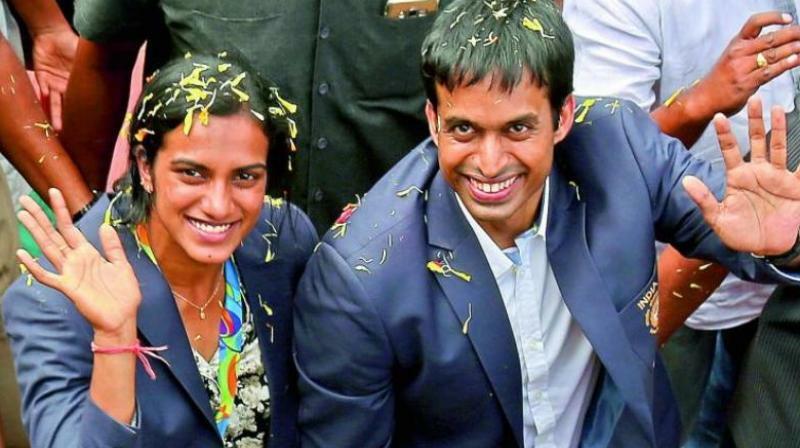 In all the big events, we have performed well and I think it is a stepping stone for the next 2-3 years, leading upto the Commonwealth Games and Asian Games, Olympic qualification and then the Tokyo Games," Gopichand observed. A hectic year lies ahead for India as a host of big- ticket events, including Commonwealth Games, Asian games and World Championship lined up. Asked how he plans to make the players peak at right tournament next year, Gopichand said: "We will have the periodization and planning for next year but it is going to be a challenge because there are too many important tournaments too close (to each other). "There is All England and Commonwealth Games which are close to each other. Similarly, World Championship and Asian Games are close and then there are tons of other tournaments which decide the rankings, so it will be a challenge. It will be a difficult year but hopefully we will manage," the coach looked determined. Asked if All England Championship is losing its relevance, Gopichand, who won the title in 2001, said: "It is a changing world. All England has the history and lot of older people take it as the World Championship and Olympics kind of a thing. But today's day Olympics and World Championship have taken their place." He agreed that with advent of Super Series Premier and the kind of money associated, situation is bound to change. "We are having premier super series and now next year we will have grand slams and lot more tournaments have more prize money and some of them has same ranking points as the All England. Lot of people will think All England as the first among equals but things are changing." Saina has recently returned to Hyderabad to train under him after being under the guidance of Vimal Kumar in Bangalore for three years. Former World No. 1 Saina has recovered from a career- threatening knee injury to win a bronze at World Championship in August. Asked what would it take for Saina to regain her world no 1 ranking, Gopichand said: "There are lots of areas where she needs to work on. She has a lot of drive and eagarness and I am optimistic that God willing, we will be able to achieve it."